Oats are high in soluble fiber, which helps keep your cholesterol within healthy limits. 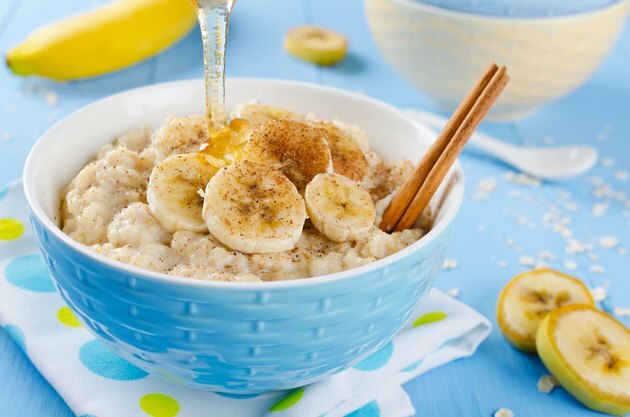 Having a bowl of hot, hearty oatmeal for breakfast may seem like an indulgence, but a cup of cooked regular or quick oats cooked with water contains only 166 calories. That same serving contains almost 6 grams of protein to help keep you feeling satisfied throughout the morning as well as 4 grams of fiber. If you find yourself feeling rushed in the morning and don't have time to whip up a fresh batch of oatmeal, making the cereal in a large batch ahead of time and freezing it will allow you to have a hot, healthy meal to start your day without having to spend a lot of time over the stove. Spoon cooked oatmeal into freezer bags or plastic containers with lids if you want to freeze larger portions. Push as much air as you can out of the freezer bags before sealing them to keep the cereal fresh. Freeze individual servings of oatmeal in a muffin tin for ease of portioning. Spray the muffin tin with nonstick cooking spray or use a nonstick pan. Cover the muffin tin with plastic wrap and place it in the freezer for several hours, or until the oatmeal is completely frozen. Thaw slightly until you can pop the oatmeal "muffins" out of the tin using a spatula or thin knife. Place them in freezer bags to store and freeze so you can easily remove a smaller portion size to reheat. Is Eating Oatmeal in the Morning Making Me Tired?